The Drane-kooler™ water tempering device mixes cold water with hot discharge water to reduce the water temperature before it enters the drain system. This complies with code requirements and prevents damage to PVC drain piping. 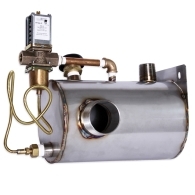 The temperature-actuated valve is time-tested to be reliable and maintenance-free. And because it is non-electric, no wiring is required. Multiple mounting options. Attach the integral mounting plate to a wall, adjustable floor stand, or by using an assembly for suspension mounting.